People working in rodent removal and wildlife control get variants of this question all the time: “How is that wild subway rat any different from the rats I see for sale in pet stores?” Or, “Could I just take a rat off the street as a pet?” Here’s the answer: wild animals are wild for a reason, and pets are pets for a reason. In fact, wild rats and pet rats are physically and mentally quite different. So while your friend’s pet rat might make for an adorable and loveable pet, the rats you encounter on the street definitely do not. Because while the average pet rat is quite clean and well behaved, wild rats can be downright dangerous. Domesticated rats, also called “Fancy Rats”, are a subspecies of wild brown rats, essentially. They were first bred into being by rat-catchers and others in the 18th and 19th century. These breeders enjoyed using the rats for blood sports and rat-baiting (yikes!). Two famous rat tamers capitalized off smaller, rarer, more colorful rats, breeding them and selling them as pets. And, yes, fancy rat is the scientific term for these popular pets. Domesticated and wild rats breed at about the same rate. 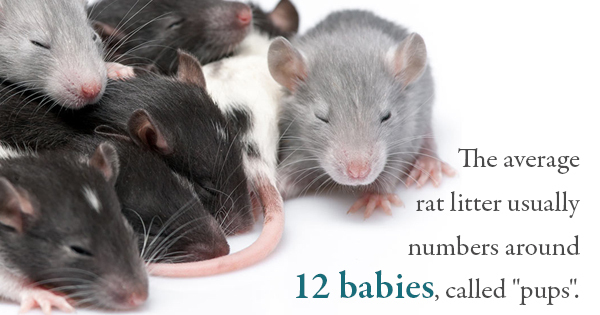 The average rat litter usually numbers around 12 babies, called “pups”. Both are smart and social creatures, although obviously wild rats prefer to socialize with each other and not with humans. Wild rats typically live less than a year, while fancy rats have the comfort of human care and can live as long as two or three years. Fancy rats are also typically smaller and more delicate-looking than their wild cousins, with sharper facial features, larger ears, and a longer tail. Esthetically, wild rats are usually the dominant brown color with rare variations. Extensive breeding of fancy rats means there are dozens of color varieties, and even physical quirks like the comical ears of Dumbo rats and the missing tail of Manx rats. Given the varied physical traits, it’s fairly easy for experienced wildlife control officers to tell the difference. Most importantly, fancy rats are domesticated. They are tame, generally enjoy the company of their owners, are trusting of new foods, and are less sensitive to lights and sounds that overwhelm wild rats. Sadly, wild rats are destructive animals who make themselves at home in human residences, eat up necessary food supplies, reproduce rapidly, and spread diseases. Damage from animals like wild rats can even cause disasters like electrical fires. If you have a hunch that there’s a rat nest somewhere in your home or business, call professional rodent removal services ASAP.